Healthy, wholesome and protein-rich green moong dal recipe made easily and quickly in the Instant Pot. It is best served with plain rice or jeera rice. This can be served with roti or paratha too. 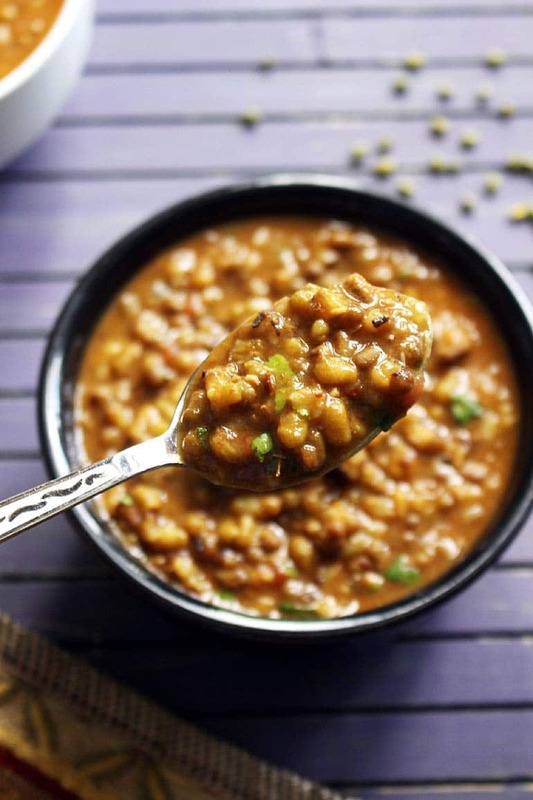 Or have this as a green gram lentils soup with a piece of bread or baguette. To make it more healthy you can add vegetables like carrot, spinach, kale, broccoli etc. and Instead of water use vegetable stock or broth. What I like most about this instant pot green moong dal recipe? There is no need to soak them. You know that when we work with any legumes, we need to soak them for few hours or overnight. But that is not the case here. Because we are cooking in Instant Pot pressure cooker. 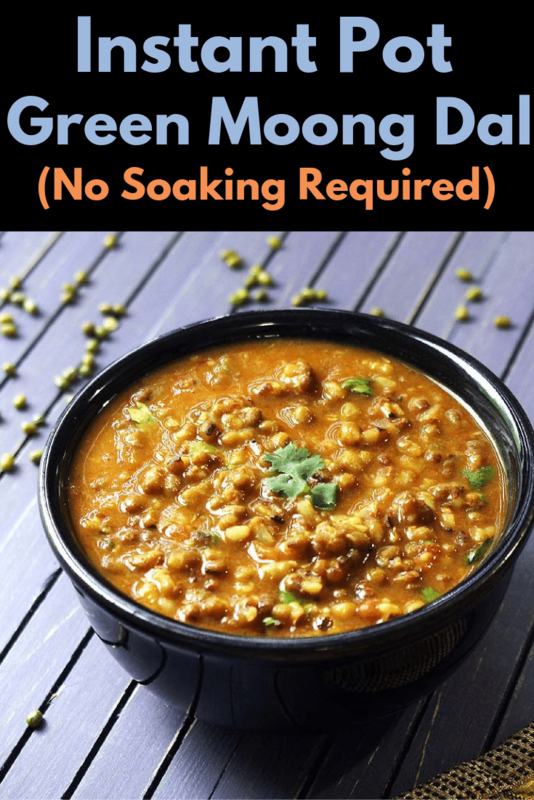 To make this whole green moong dal recipe, I am using pre-made frozen instant pot onion tomato masala. So making this recipe is just dump and go situation in instant pot. That’s why I like to invest some time once a month to make this instant pot onion tomato masala. You should make it too. Once you have it ready in your freezer, making many Indian recipes are a breeze. If you do not have frozen OTM ready, you can still make it. I have mentioned that method in the notes section below. At the time of serving or eating, we are adding lemon juice and chopped cilantro. Lemon juice is MUST. It perks up the flavors and takes the whole dish to another new level. Make this recipe in your IP, Enjoy and let me know your experience in the comments below. 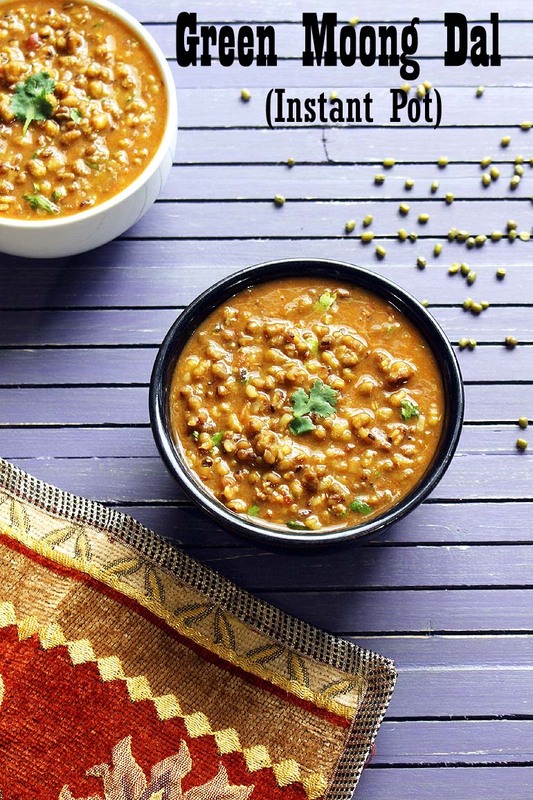 This healthy green moong dal made quickly in the Instant Pot. 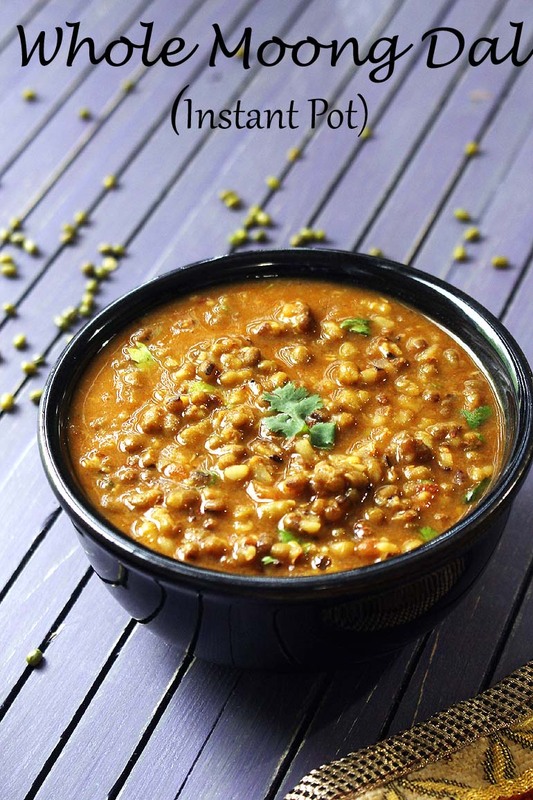 It goes very well with plain rice or roti or have this green gram lentils soup as such with a piece of baguette bread. Turn on the IP with saute mode. Once hot add oil and cumin seeds. Let the seeds sizzle. Now add onion-tomato masala, green moong dal, salt, red chili powder (if using) and water. The onion tomato masala already has chili powder and salt in it, so be careful. Cover the IP with lid and keep the valve to sealing position. Cancel saute mode and turn on the manual (high pressure) mode for 15 minutes. Let NPR and open the lid once pin drops. Add lemon juice and chopped cilantro. Mix and it is ready to serve. Once cumin seeds sizzle, add ¾ to 1 cup of chopped onion, 2 teaspoons each ginger and garlic paste. Saute till onions are soft and translucent. Then add 1 cup chopped tomatoes and cook for 2 minutes. Add ½ teaspoon turmeric powder, 1 teaspoon red chili powder and 1 teaspoon coriander powder. Next add green moong dal, salt, and water. Follow the pressure cooking time and rest steps as mentioned above.